The keyboard is one of the most crucial parts of a computer, without which it’s nearly impossible to access the system. Yes, we do have the touch screen computers today, but very few of us use these systems. For some, it can be challenging to use the usual QWERTY format in the way they are already arranged. But if you want to customize the keyboard according to your convenience you can use key mapping software. For instance, you may want to replace the position of the “Tab” key with “Ctrl” key, you can use the programs to remap them. You can also add new personalized keys, or deactivate any key for added convenience like disabling the “Fn” button. Moreover, there are times when some of your keys might have stopped working making it tough for typing. While using a macro tool can help you remap keys or operate a shortcut service, these need to be saved in the system memory for them to work all the time. Therefore, using a key mapping tool can be the best alternative as these do not need a process to run the background for it to function. Here we have listed some of the best key mapping software programs that you can use instead of 3rd party tools. 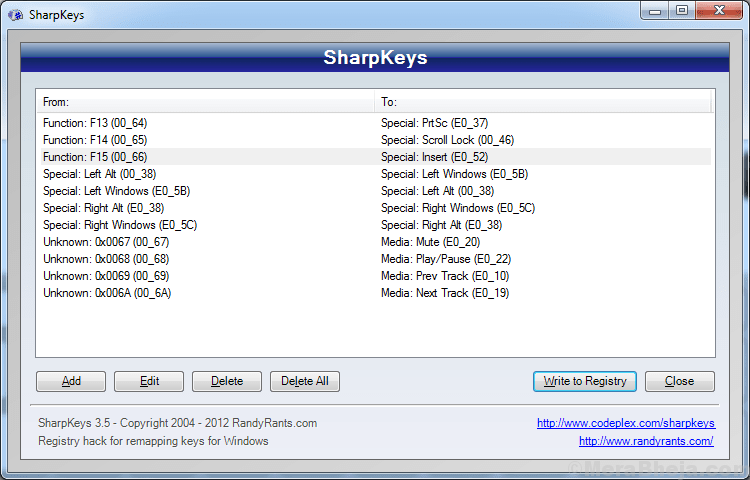 If you are having a tough time re-mapping the keys on your keyboard, SharpKeys does the job for you. It can change the way how different keys work, efficiently. For instance, if you are having a tough time with one of the keys like hitting the “Fn” key accidentally every time you want to press the “Ctrl” key, you can either disable it or change its function to a different key. The software helps you map up to 104 different types of combinations! It’s a pretty easier tool to start with an empty interface to work upon. It shows only the edits that you have made unless you hit the “Add” option to start remapping a new key. The interface then gets divided into two vertical panes of which one shows the “From Keys”, and the other one shows the “To Keys”. You can now select the “From key” from the list on the left, and move it to the “To key” on the right where it is mapped. However, since not all the keys listed may not be available on your keyboard, you can make your choice by pressing the “Type Key” option and then hit the physical key you want to select. You must complete the process by hitting the “Write to Registry” option and wait for the successful mapping confirmation by the registry. Now, shut down the application and log out, or restart to apply the new mappings. 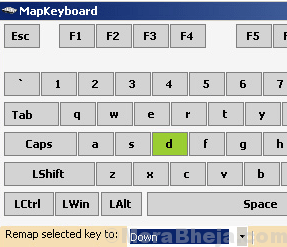 Keytweak is one of the keymapping software programs that lets you remap the keyboard keys. It enables you to alter all the mapped keys, activate/deactivate keys, and even store your alignment in a single click. On launching the user interface of the software, it shows the alignment of your keyboard in association with a range of buttons and commands. Here you can assign each key as per your requirement and place it beside a command or simply let it be empty to deactivate it. As the mapping is done, the keys store your command and activate the software function. From here on, your keyboard starts getting mapped as per your set alignment. Whether it’s for the safety of your system, simply to redefine the keys to operate a program, or you need it to play some game, there are many reasons why remapping can be good using this software. Alternatively, the remapping of keys is also useful in case any of the keys are damaged and they have stopped working. If you are looking to configure your keyboard, Key Mapper is just the right tool that can help you with it. Using this software, you can remap the keyboard keys as per your choice. For instance, you can change the function of one key (Caps Lock) to work like another (for example, Ctrl), or to any other function that may not be even present on your keyboard. This free application is available for Windows 2000 and previous versions. It’s a lightweight program that does not occupy much storage space compared to many other similar programs. It comes equipped with a various keyboard designs (pre-set) such as, featuring a number pad which is not present in most laptop keyboards, Mac keyboard, or typewriters key alone. 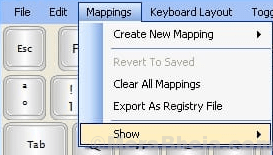 In order to map a key, all you need to do is to either use the software’s key capture feature or just pick a key from the list and prepare a new mapping. Wondering how to use the key capture feature? All you need to do is to choose the desired key and hit the set button, pick a key group and a key from the list, and hit the map button. Now, the virtual keyboard will show you a new key replacing the old one. If you want to deactivate the mapped key at a later date, you can easily do that by simply pulling it away from the keyboard. In addition, you can also change the attributes of the key like the color, add toggle function to the key menu, choose another language, and much more. Most keyboard mapping programs take up considerable storage space. However, MapKeyboard is a really small and one of the best key mapping software programs around that occupies only 30KB in file size. You can easily customize the keyboard layout settings using this free software, despite the missing hotkey feature. The interface of the program is a lot similar to the usual keyboard image that’s easy to use by the majority of the users. It’s easy to use and easy to understand even for the beginners. It lets you replace a keys function using a pull-down menu of the output keys. What’s more? It also allows you to create different layouts that match your requirements. Moreover, you can also quickly return to the actual keyboard layout in just a single click feature that helps reset the keyboard. Overall, it’s a handy software and offers an effortless way to customize your keyboards. Key Remapper by ATNSOFT is one such key remapping software that enables you to disable keys/mouse buttons/mouse wheel rotations and even remap them. Moreover, it also carries out counter remapping of keys and mouse buttons. It basically modifies their functions. For example, you can change the Left Shift and the Caps Lock, and other such combinations. It also allows you to replace certain keys or mouse buttons by a mix of key or mouse button with modifiers. For example, the “Alt” key can be replaced with a combination function such as, “Alt+Tab”, etc. You can even mirror the double mouse button and key hits, and fix a certain interval between the hits. In addition, it allows you to block keys, mouse buttons, or the mouse wheel rotation along with their combinations with different modifiers. Not just that, it also limits the remapping and blocking functions to certain programs and Windows. It also helps you create and change between key sets quickly, in just two clicks. AutoHotkey is a lot different from the other best key mapping software in the list. It’s a much powerful application which is easy to learn. It allows you to assign hotkeys for the keyboard and mouse, remap keys or buttons, and even offers the auto-correct type swaps. The software makes it incredibly easier to create simple hotkeys in just a few lines. This free and open source software comes with a dedicated scripting language for Windows helping you to create small to more complex scripts, effortlessly. It helps you create scripts for all types of tasks that includes filling forms, macros, and more. If you are a beginner, then it offers an integrated command for you. And, if you are a professional, then you will all the more appreciate the skilled scripting language for quick prototyping and limited projects. The program offers you a lot more flexibility to automate any desktop task. It’s compact, quick, and is ready to use. It comes with a straightforward and adaptable syntax that helps you stay focused more on the task than focusing on each of the technicalities. If you are looking to customize your keyboard layout right from the ground up, then Microsoft Keyboard Layout Creator can be your best bet. 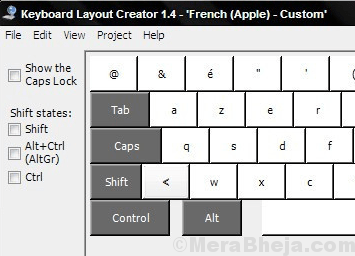 It helps you define your keyboard layout in a language unsupported by Microsoft, quickly, easily, and effectively. You can also create your own keyboard layout that helps you to quickly and easily replace your preferred symbols with just a few keystrokes. While it helps you define new keyboard layouts right from the ground up, it also helps you create a new layout on the current one. Moreover, it allows you to change a current keyboard layout file and create a new layout out of it. Additionally, it saves the subsequent keyboard layout results for further use and installation. Key Manager by ATNSOFT is another product in their range that’s an advanced version of their Key Remapper. It offers a lot more functions than just remapping keys and mouse buttons. For instance, this software lets you even remap combinations of mouse buttons and keys, keys and mouse button arrangements, and even the long presses. You can choose to display your actions in pop-up menu forms that can be launched with hotkeys, edit, record, paste content, run macros, and much more. Imitating mouse clicks, opening websites, changing the layout, filling up forms instantly, or controlling the power settings of the monitor are some of the other things that you can choose to display. Price: free license available; upgrade starts from $49. If you intend to extend your key functions, KeyExtender can be of great heal to you. It helps you to make your keyboard alignment more convenient for you to work or play games. That’s not all! You can also change your usual keyboard format (102) into a cross-functional keyboard without spending much of your funds. Whether you want to replace A key with E key on your keyboard, want to add the Crtl+V function to a single key like the “Tab”, or want the F9 key to type frequently used text, the software is apt to take care of all that and more. The interface is simple, compact, and nonresizable, and is comparatively much easier to use and understand. It uses pull-down menus to change the way a key works. It also allows you to easily define hotkeys using the Settings options and enable or disable the impact of the software on your keyboard. Overall, if you are looking for a skilled remapping software, KeyExtender can be the solution. Keyboard Layout Manager is a dynamic software that offers an impressive range of characters to be deployed in different languages or specific areas. This program offers the opportunity to map almost all characters that you require, to one of your preferred keyboard keys and define customized layouts. It’s a lightweight application and is pretty compact acquiring only up to 1MB of your hard disk space. Given that it cuts down your system resources utilization, it automatically becomes light on your computer. You can select from a range of option from the main window, for example, language or layout, including the keyboard in use. Moreover, you can even create a new variety, in case you do not want to mess with the current ones. The virtual keyboard offered by the program is fully supported and you are also free to use any of the keys apart from the major function buttons. it allows you to assign a character using a maximum of three mouse clicks. What’s more? It also offers you the opportunity to use all of the key combinations that help you map up to 6 characters for each button. Overall, it’s a robust tool that helps you map your keyboard keys easily and effectively. While many of us are comfortable with the usual QWERTY layout of our keyboards, there are many who prefer it to be their way. So, if you are one of the latter and looking for one of the best key mapping software, this post is for you. Make a pick from the list and map keys fast and easy with your chosen software.